The snow deluge began on Friday, November 28th and continued throughout the weekend and in to the start of this week, depositing around 1.5 metres (five feet) of snow across the area - believed to be the biggest single fall for 20 years. 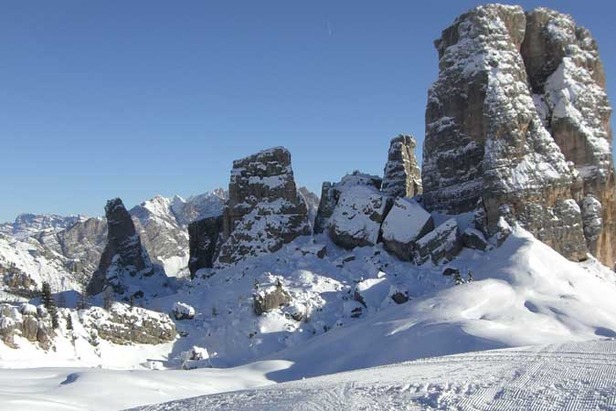 In just three days the famous resort of Cortina d'Ampezzo reached the same snowfall total as for all of winter 2007-8. The excessive snowfall did cause some short term problems however with many resorts cut off from the outside world by the snow and almost all passes in to the Dolomites closed. The snow also brought down power lines leaving some villages without electricity. However the snow also brought a big economic boost to the region as ski pass sales, including season tickets rocketed right at the start of the season. The snow should be of more economic benefit to hard-pressed lift operators too in these days of economic downturn because they will need to use less energy to make snow with machines. Some observers believe enough snow has fallen to last all winter, so long as the weather stays cold enough, even if no more falls.